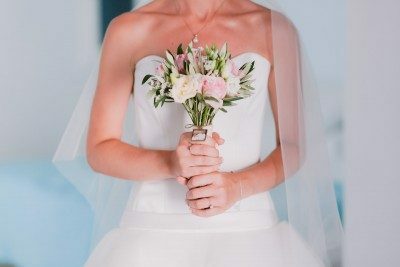 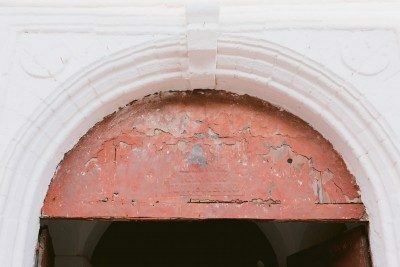 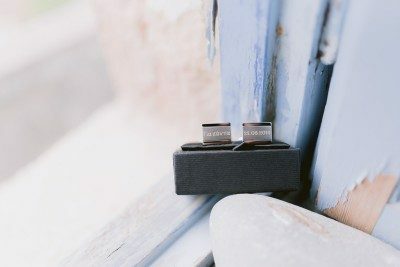 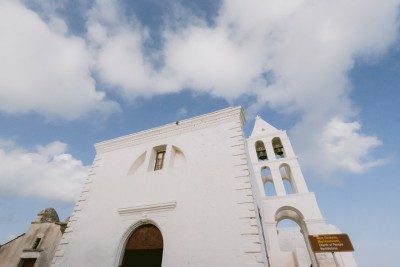 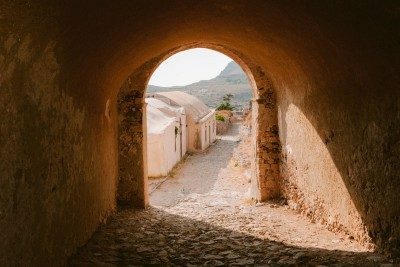 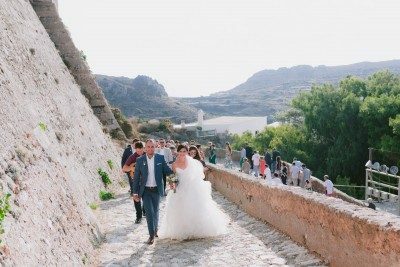 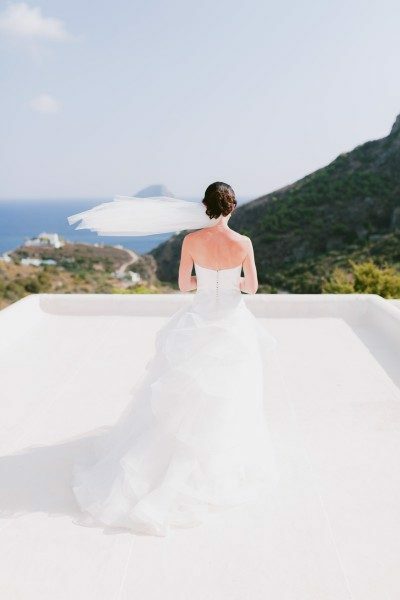 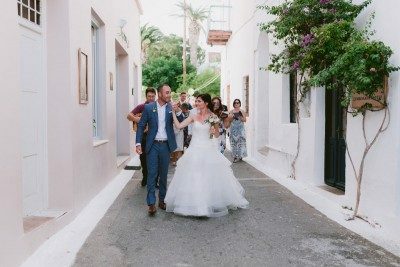 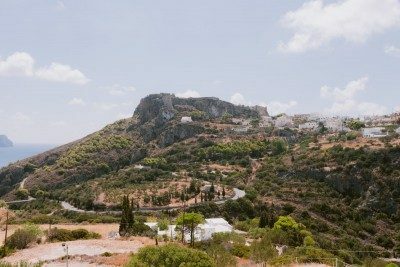 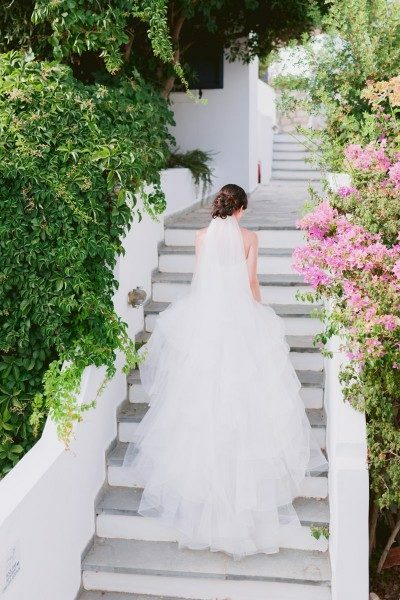 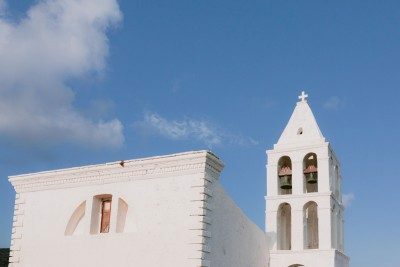 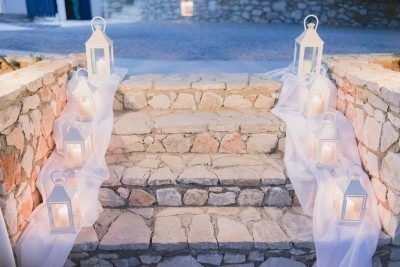 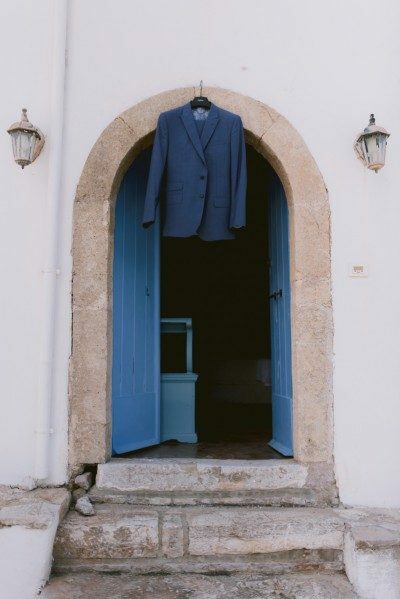 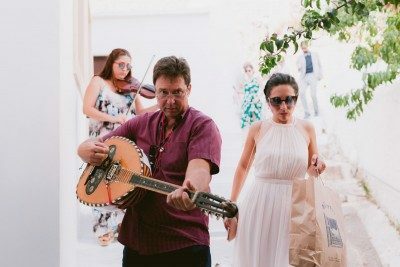 Welcome to a great love story, the story of Phillip and Julie, a Kythera wedding in the castle of Chora. 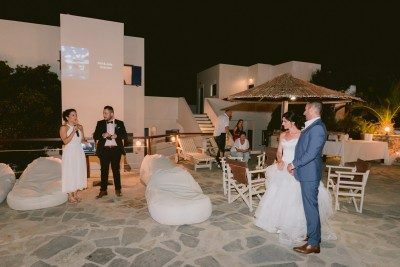 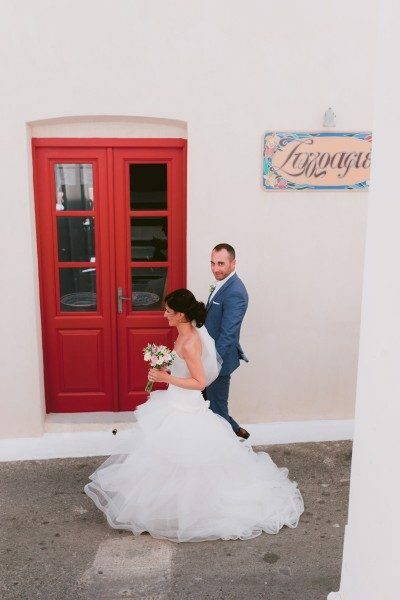 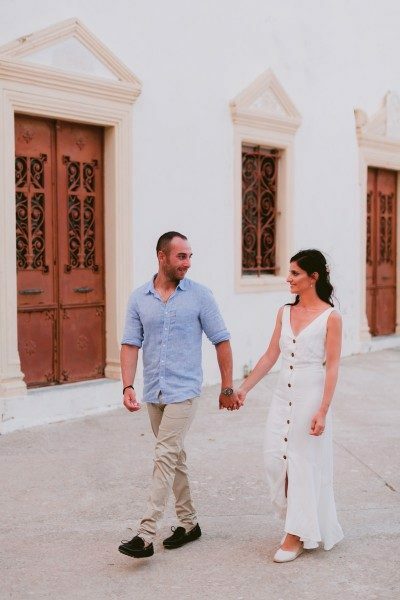 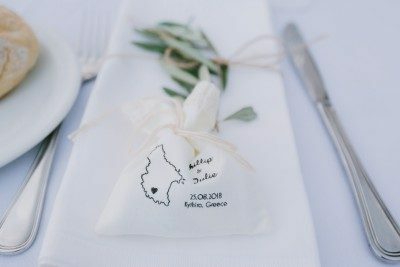 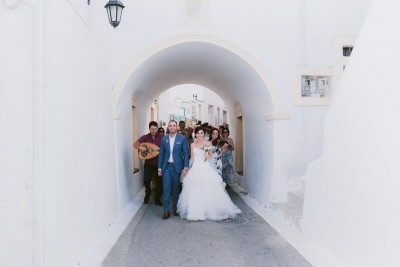 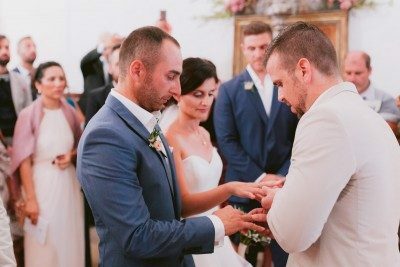 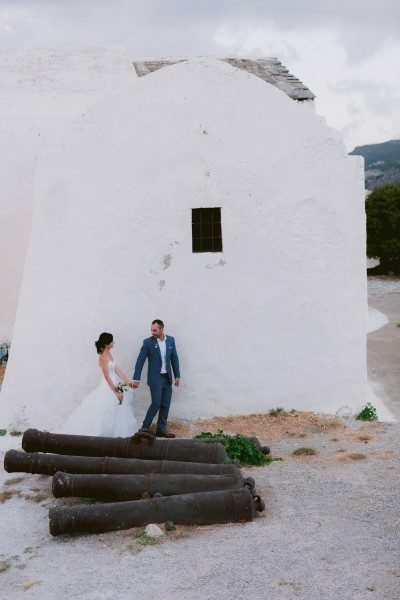 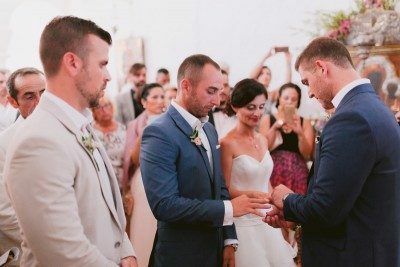 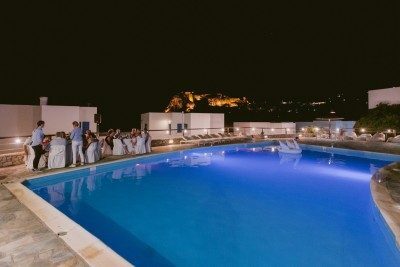 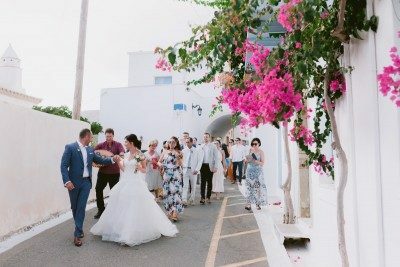 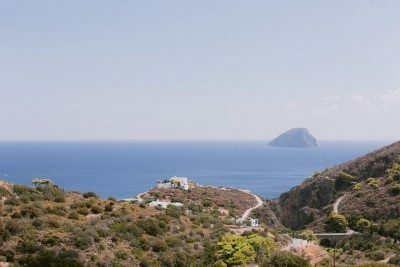 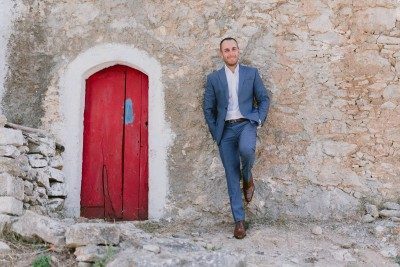 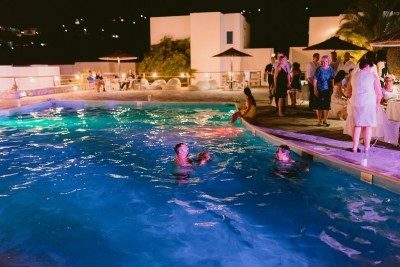 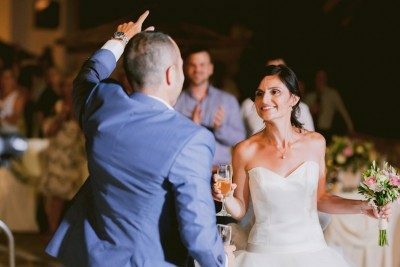 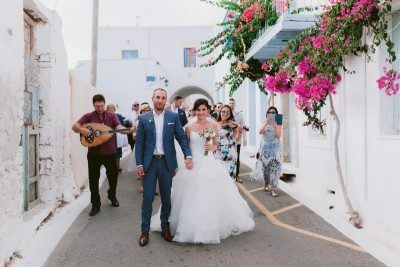 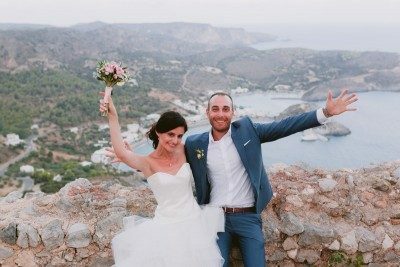 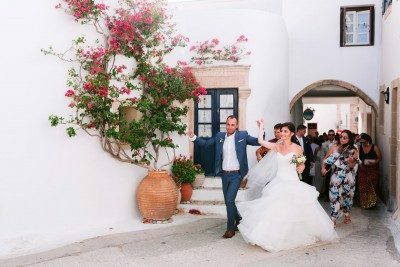 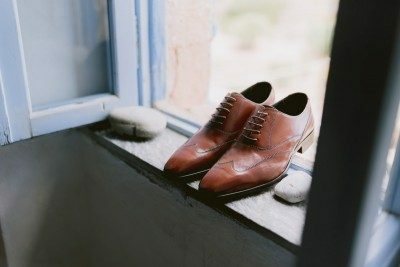 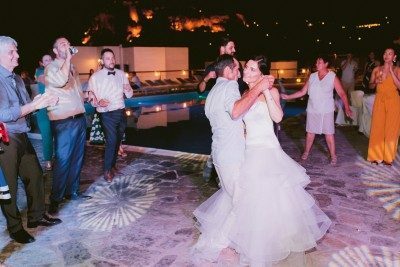 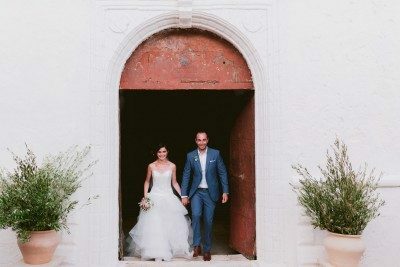 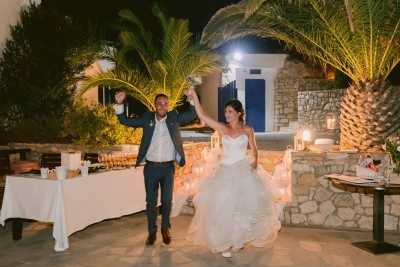 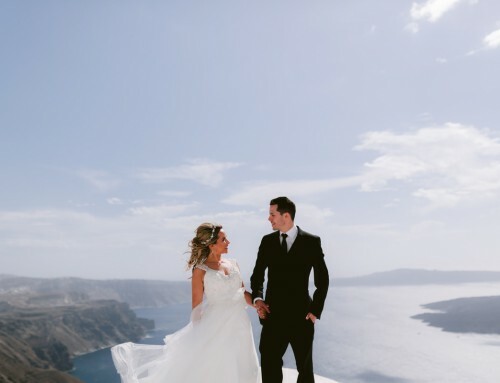 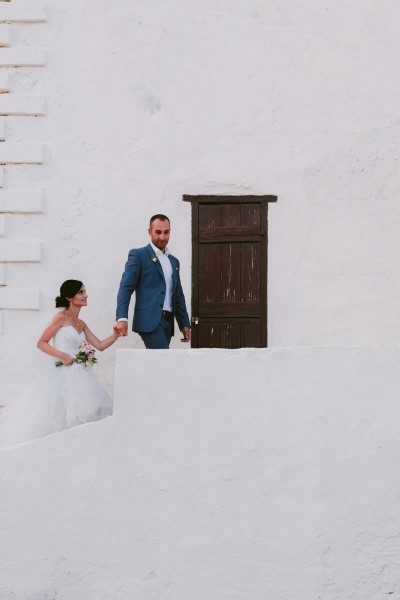 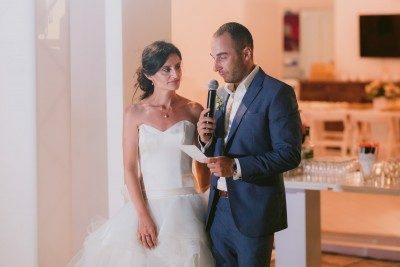 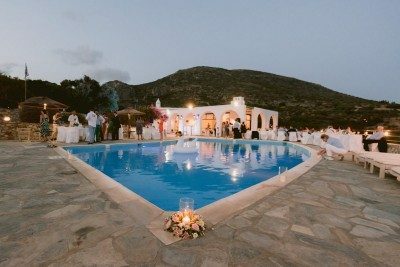 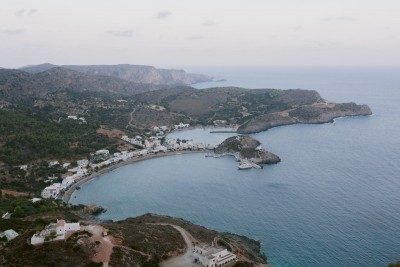 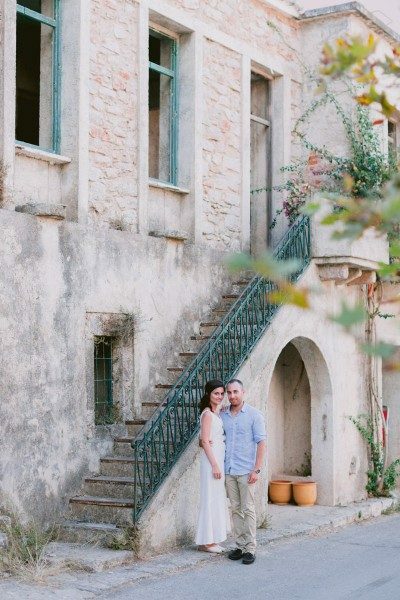 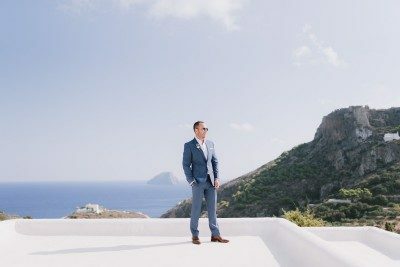 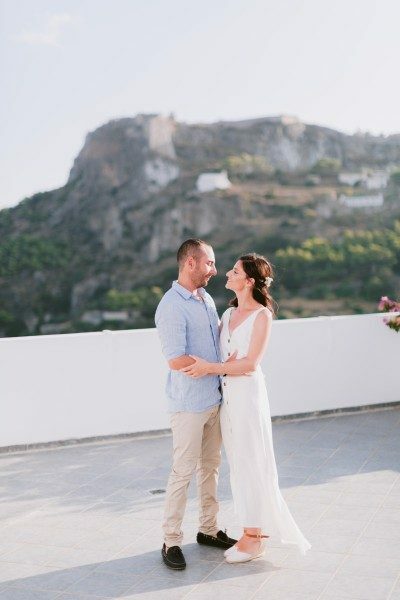 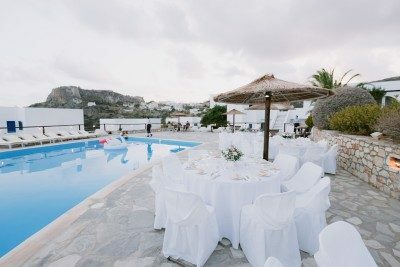 The couple who travelled from Europe to Australia and back to Kythera to have their wedding at an amazing place. 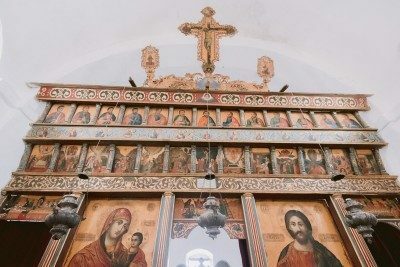 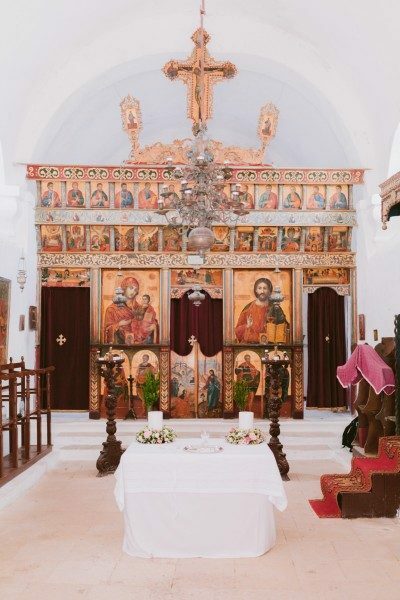 Panagia Myrtiodiotissa is a unique and old church in the middle of the old fort – castle at Chora village. 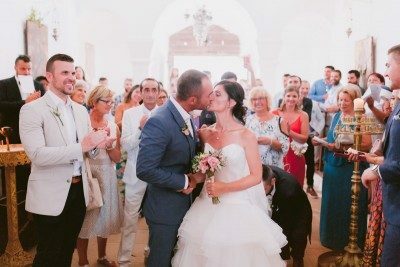 This is their story! 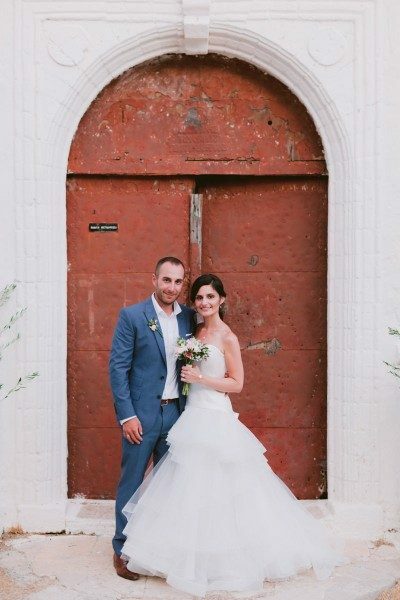 They met at a student party when Julie had moved to Australia from France. 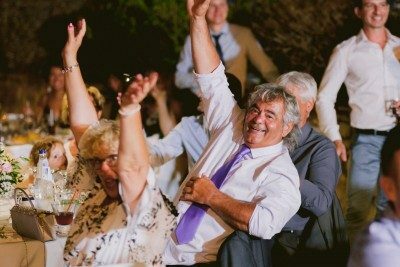 Phil come to Julie asking where she was from, as he could tell she was a foreigner. 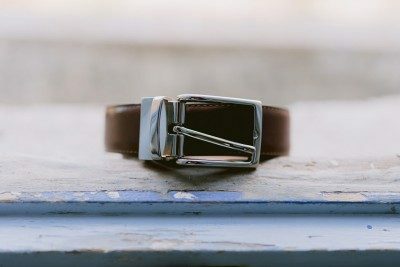 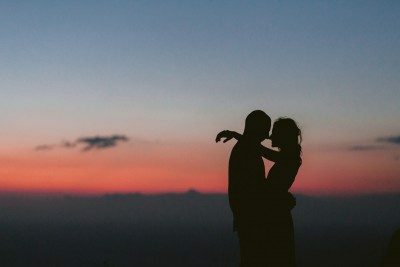 Julie said, that time was the beginning of something special. 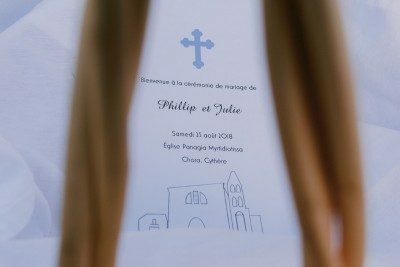 The couple got separated when Julie went back to France to continue her studies. 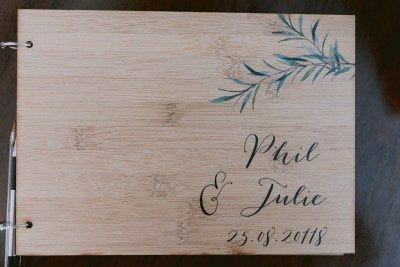 After 3 years Phillip joined her when he moved to Europe. 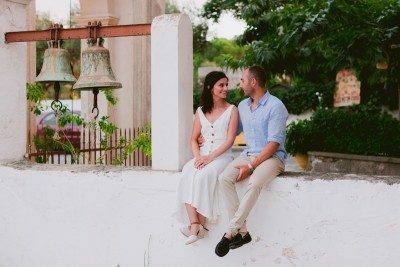 They eventually moved together in Australia where they have been calling if home ever since. 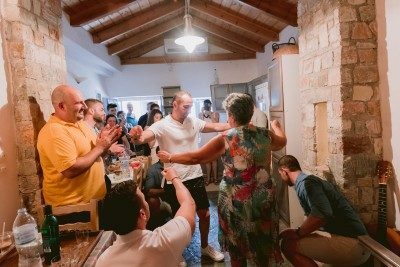 The wedding proposal happened, 10 years after they met! 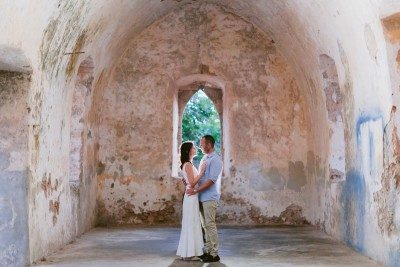 Phillip took Julie on a surprise weekend away to Maleny, one hour away from Brisbane. 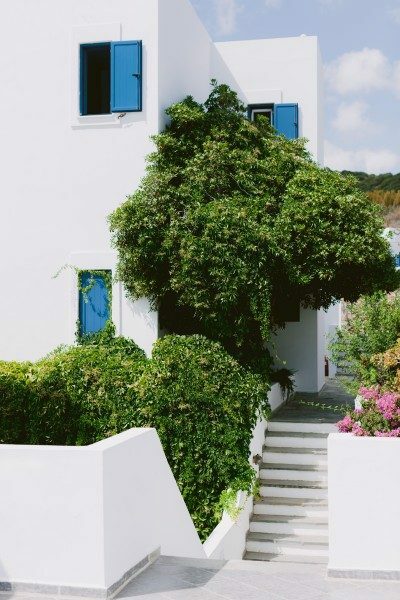 A beautiful place surrounded by the rainforest and wildlife. 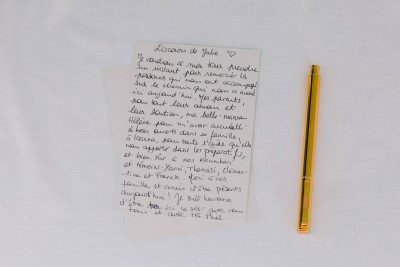 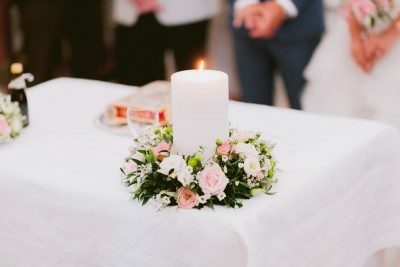 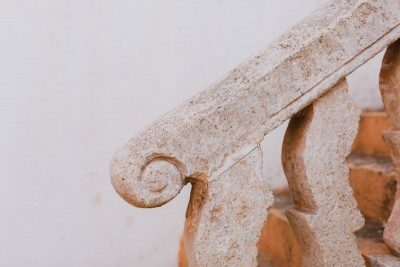 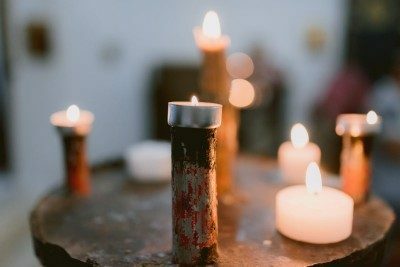 They went out for dinner, and when they came back to our place, the floor was covered with candles and rose petals, the fireplace was lit, with one of Julie’s favorite songs in the background (Comptine d’un autre été – l’après-midi, by Yann Tiersen). 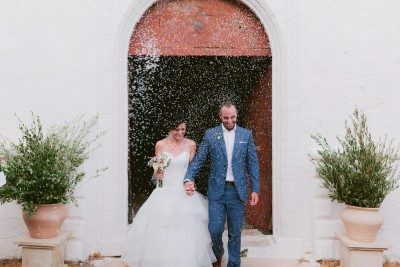 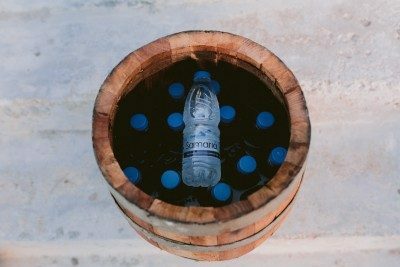 It was a magical moment! 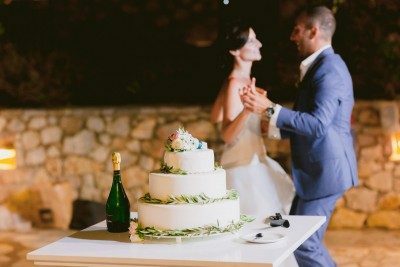 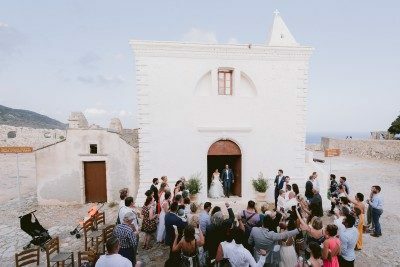 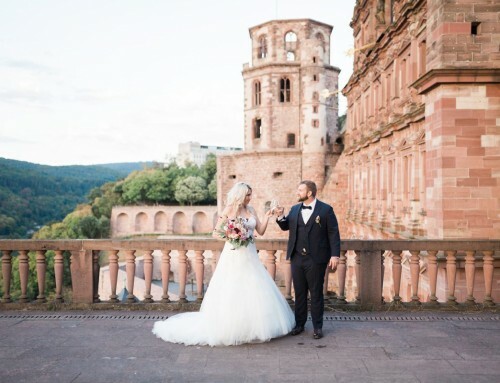 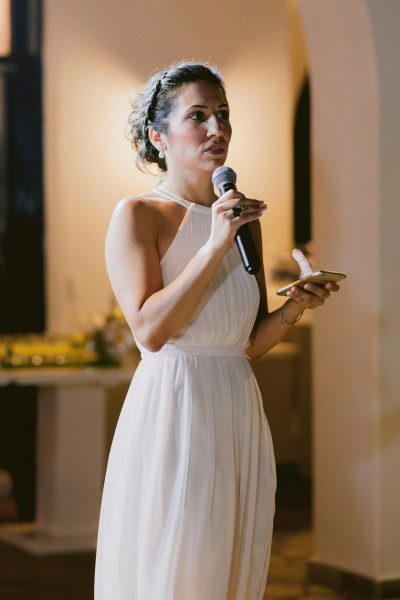 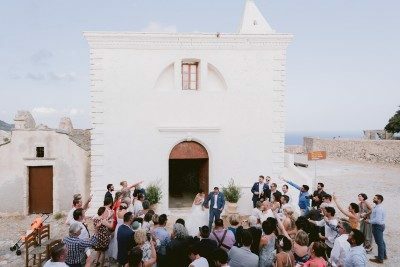 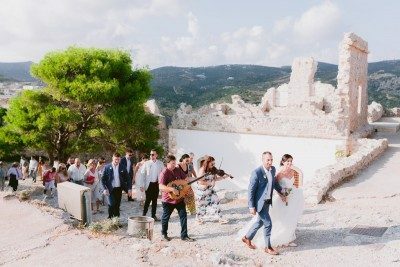 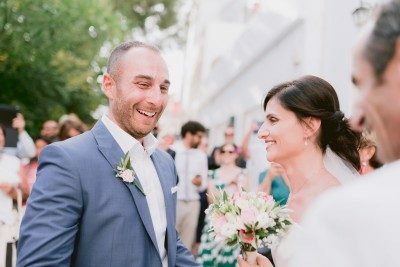 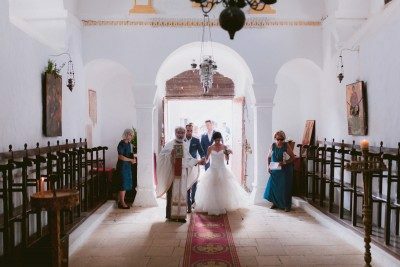 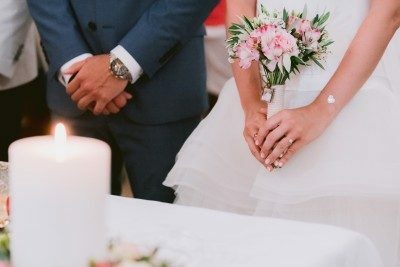 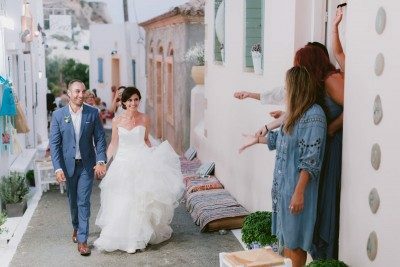 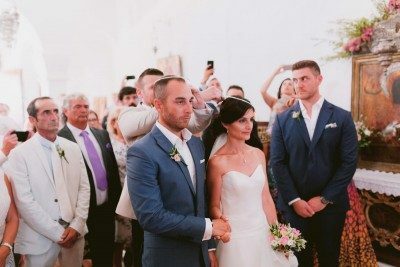 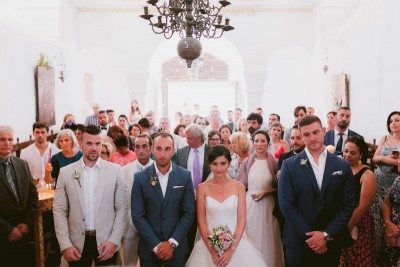 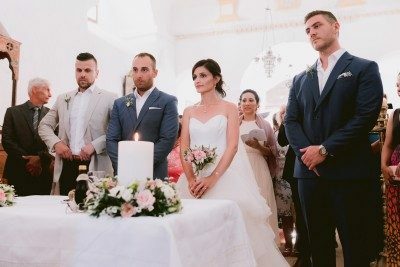 There were so many beautiful memories of the wedding, one was when they walking together to the church in the castle, with the musicians and all their guests, Greeks, Australians, French, Italians, Americans. 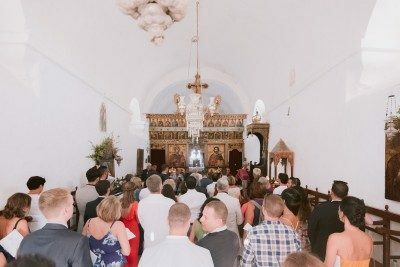 People from all over the world by their side, walking to church, was definitely a truly special and emotional moment! 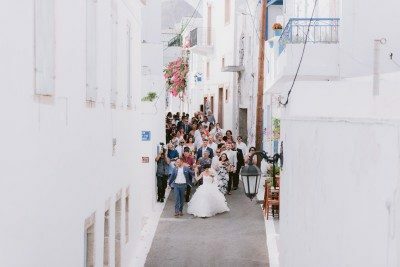 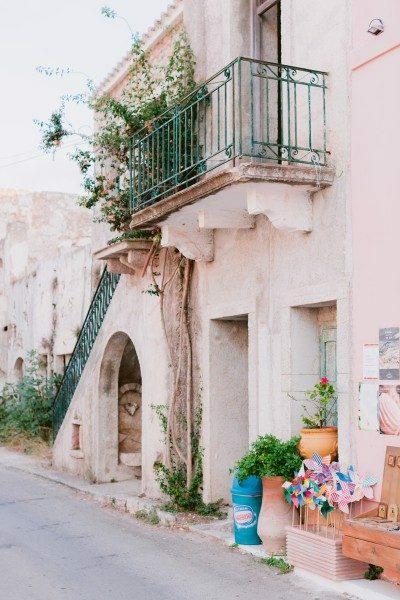 The music, the picturesque streets of Chora, the happiness and love in the air, everything was there to create a magical atmosphere. 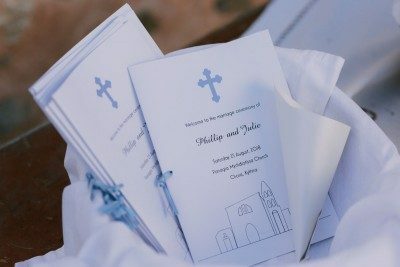 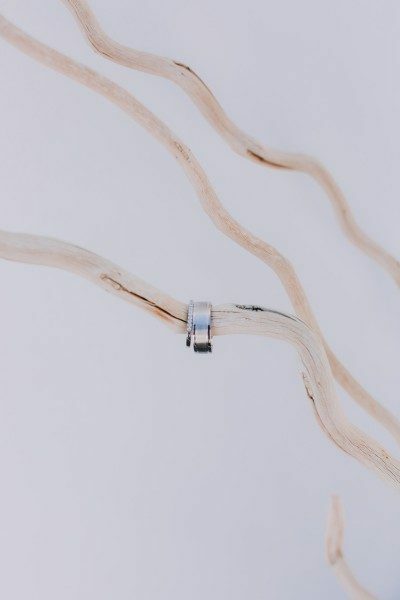 Julie remembers, the funny story was, until 2 days before the wedding, their plan was for just Julie and her family to walk to church, and to meet Phil, his family and all their friends in front of church. 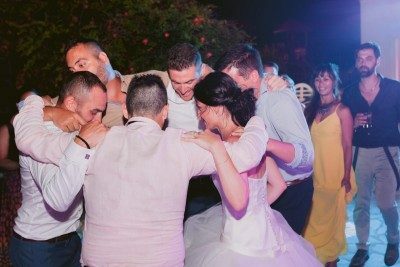 They changed their mind last minute as they wanted to spend this moment together with all their guests. 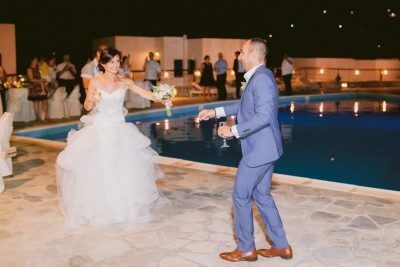 they were so glad they did, as people kept telling them it was their favorite part and that they had never experienced anything like this. 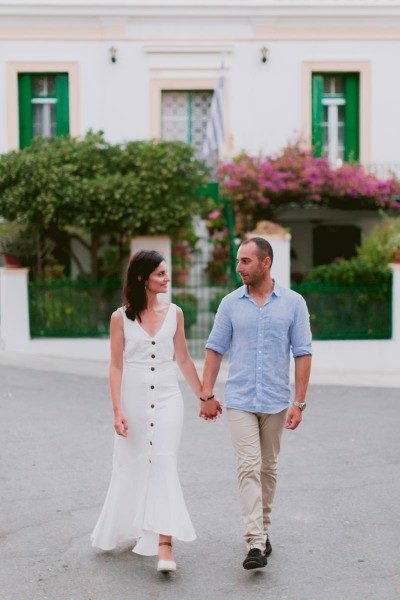 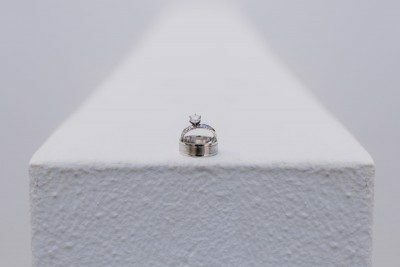 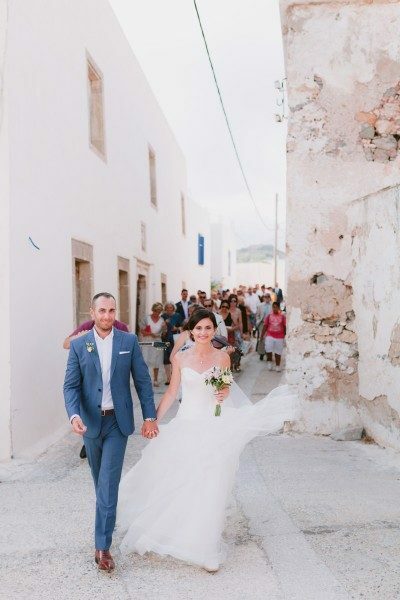 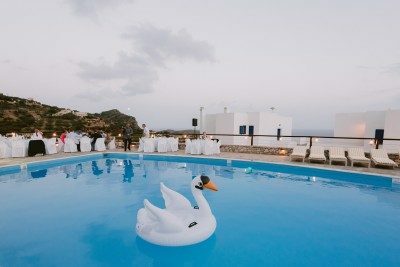 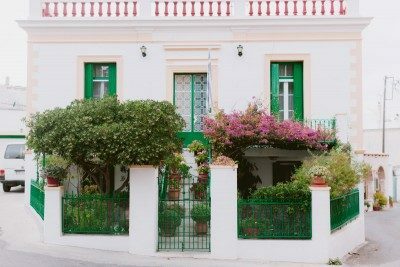 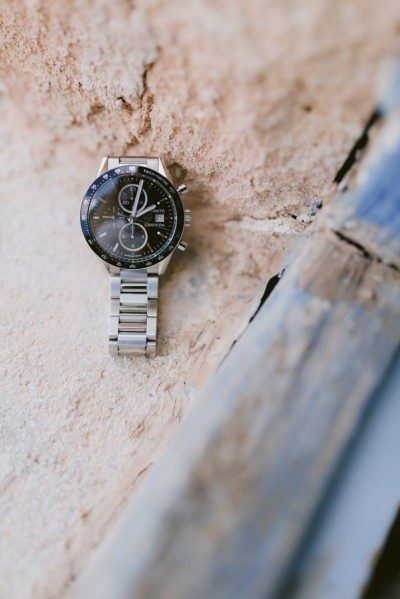 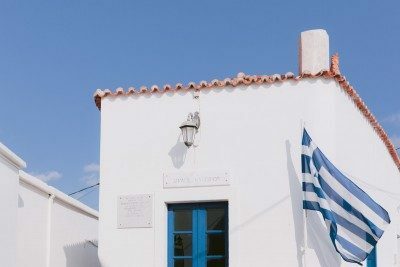 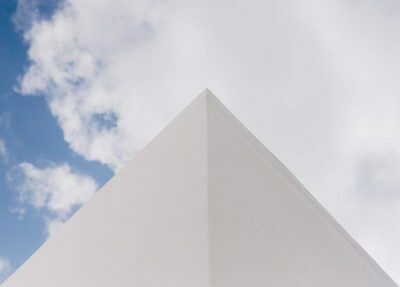 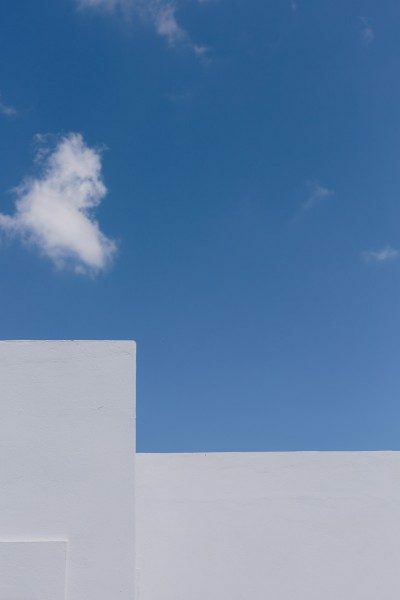 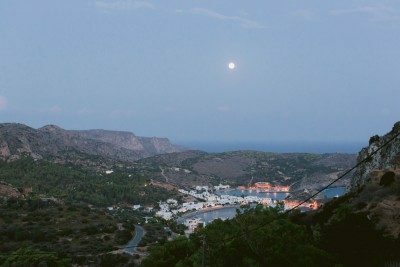 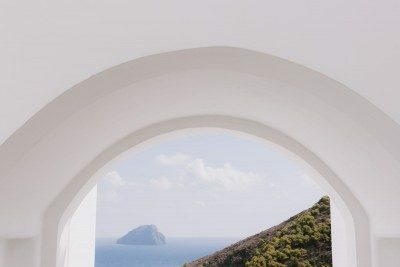 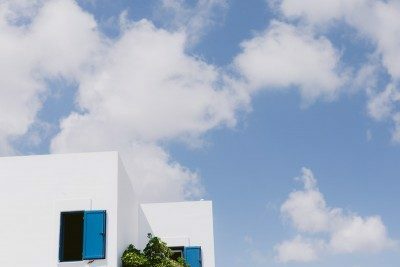 The couple wanted to represent the natural beauty of Kythera island, as much as possible. 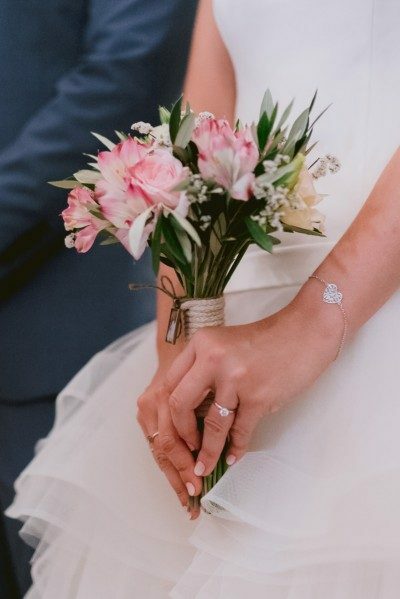 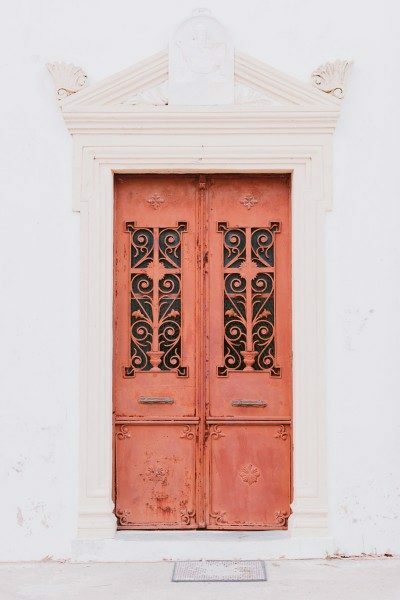 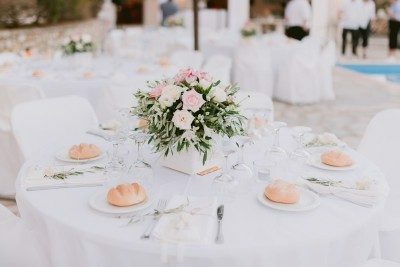 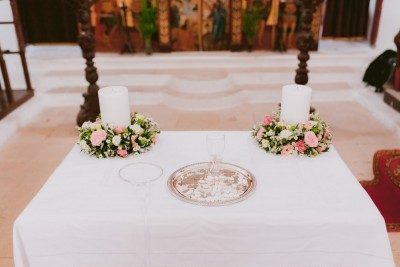 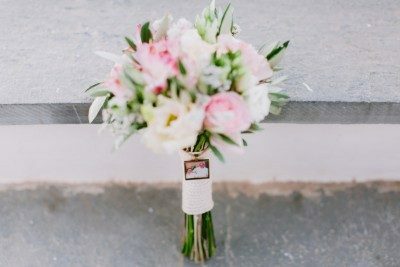 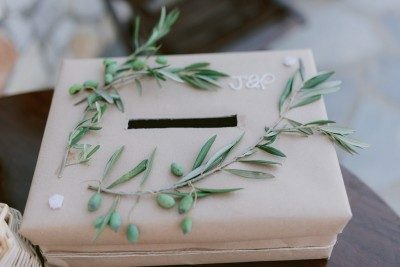 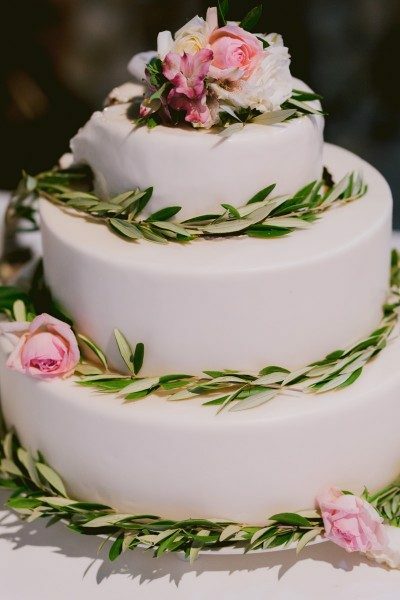 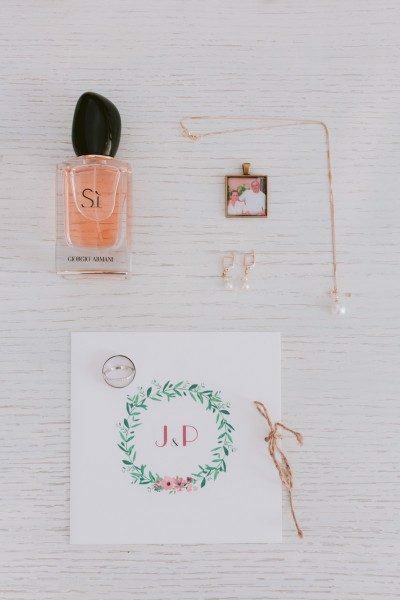 Their theme was olive branches, wood, and light, natural color flowers such as white and light pink. 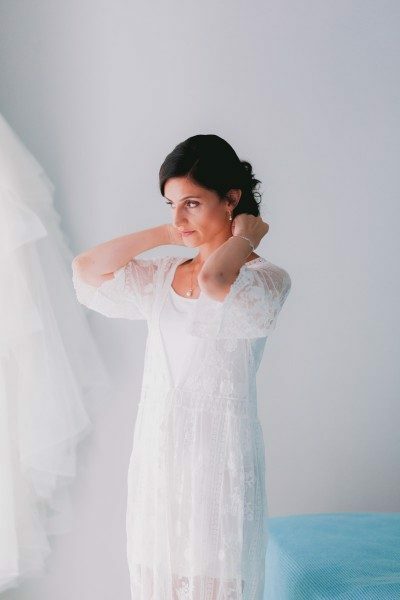 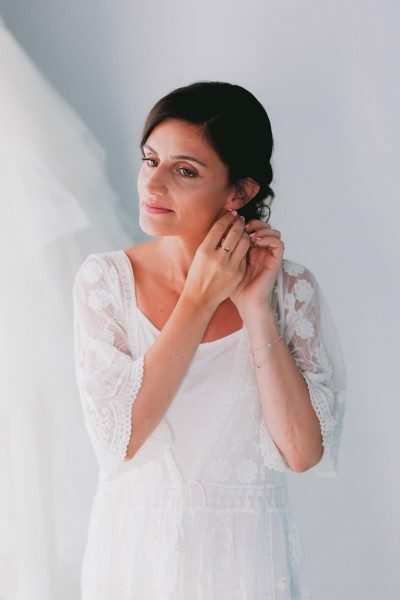 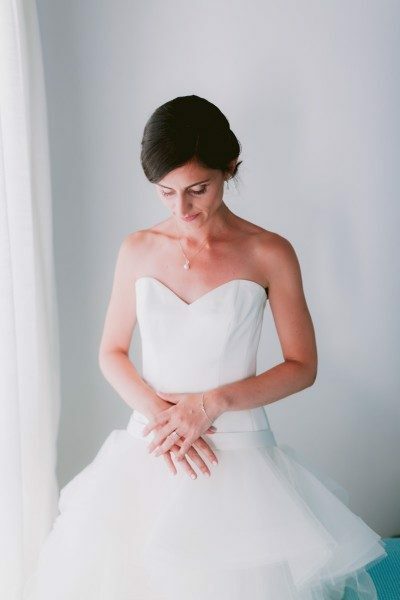 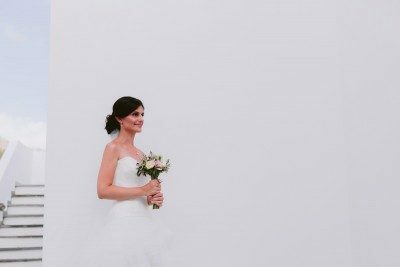 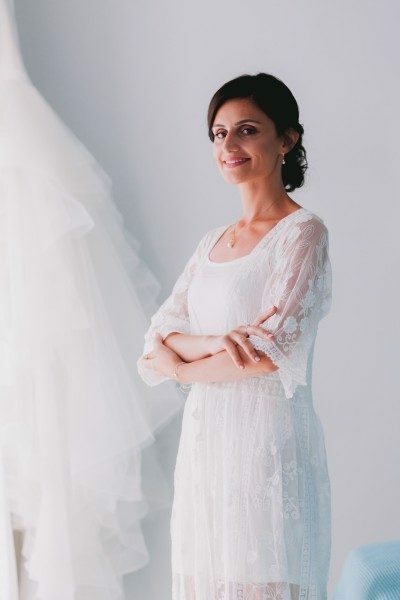 When Julie first saw her wedding dress she fell in love! 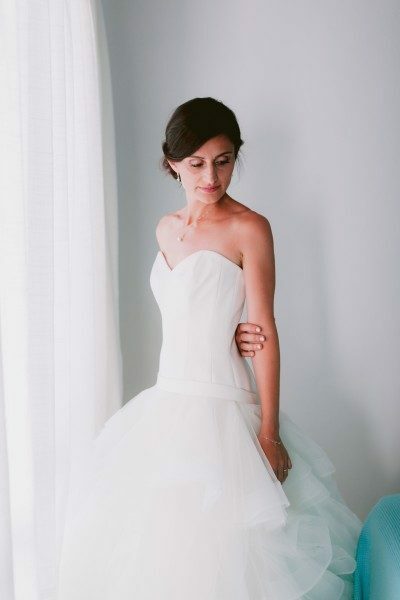 She said when she tried it on and saw her parents eyes, she knew this was the one. 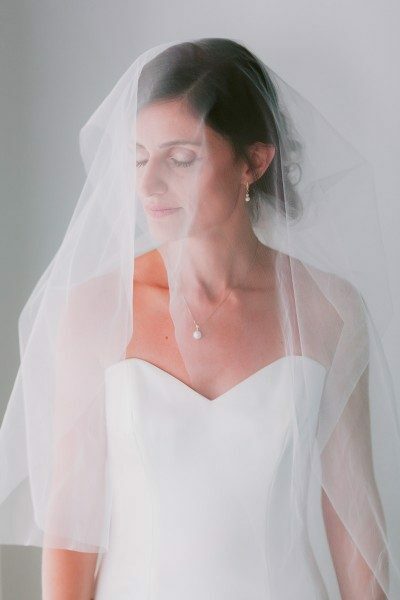 It was the only dress (out of 10 different ones) where she felt such a string emotion. 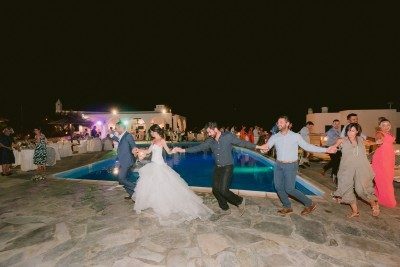 She gave herself a few days to decide. 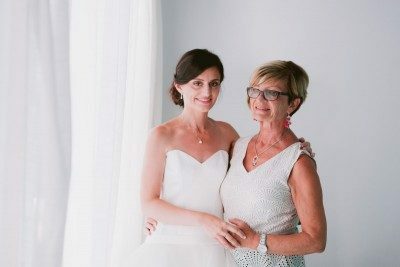 But when they showed her grandfather the photos of all the dresses she tried on. 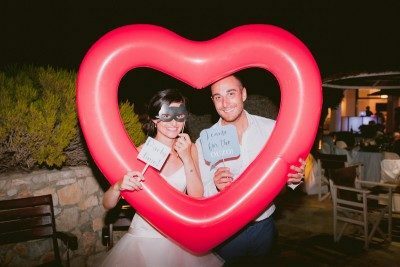 When he picked that one straight away without them saying anything, she knew this was a sign. 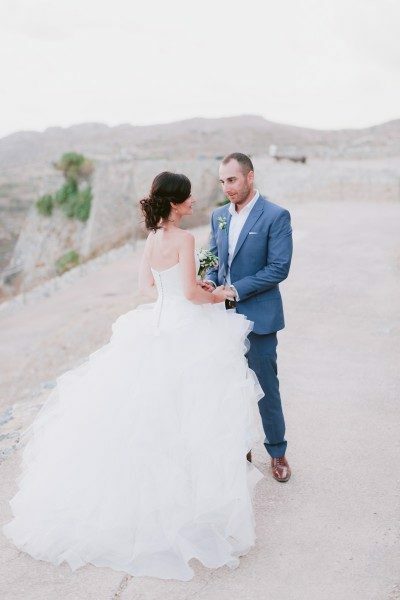 He passed away a few months later, so knowing that he helped Julie choose her dress was the most beautiful gift he could have left her. 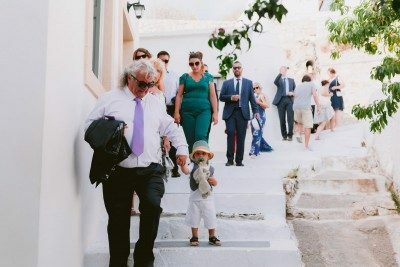 She felt her grandpa was there with her every second of that day in her Kythera wedding in the castle. 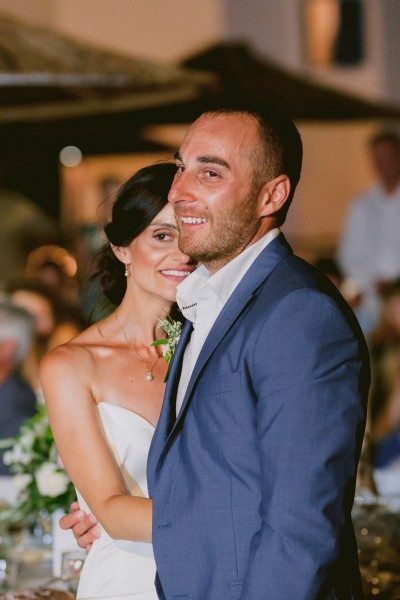 Julie and Phillip conclude, when we first saw our wedding pictures, we felt overwhelmed with love and happiness. 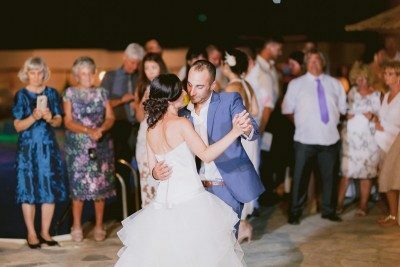 It was amazing to see how the day unfolded, from getting ready to the dance floor! 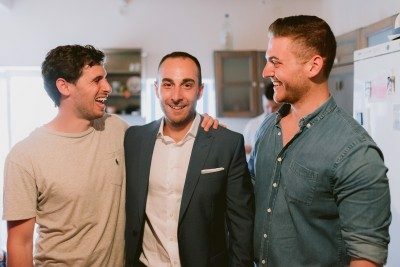 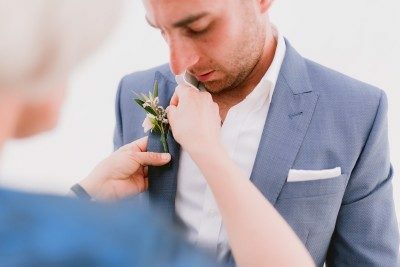 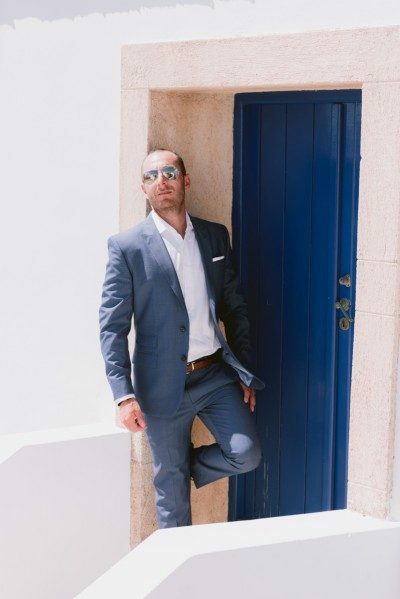 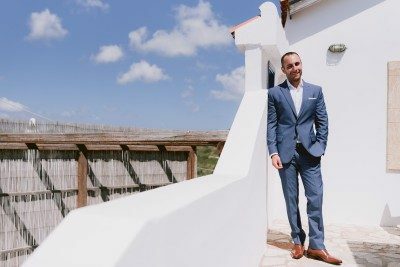 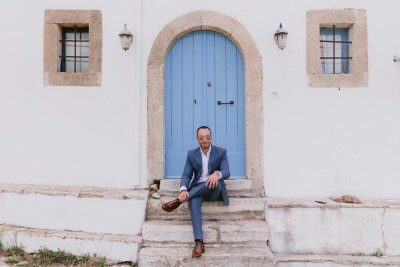 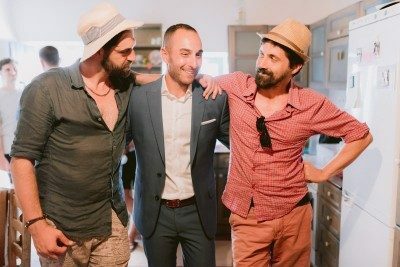 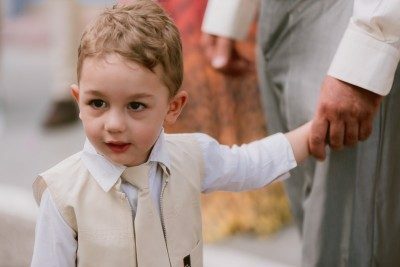 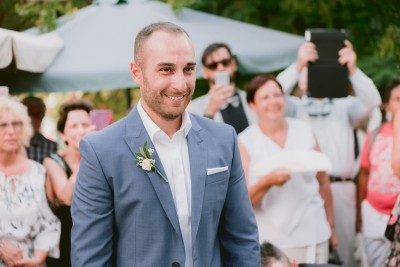 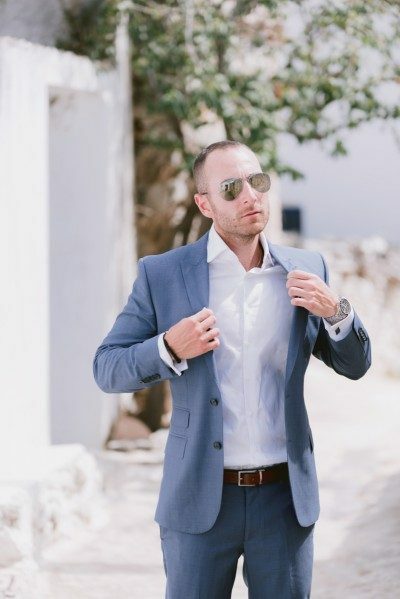 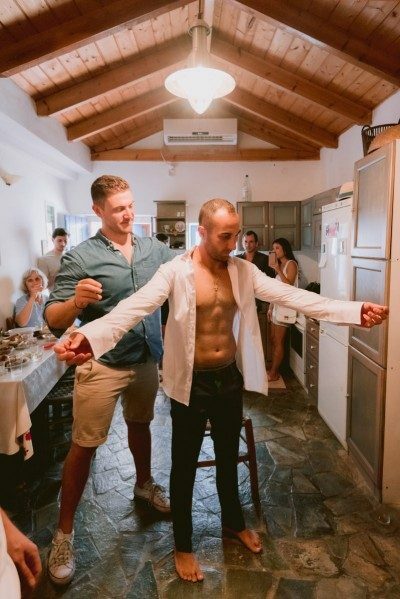 Seeing Phillip getting ready with his close family and friends, in his yiayia’s house, was truly special, and we are glad you got it captured. 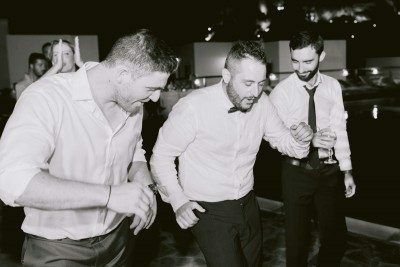 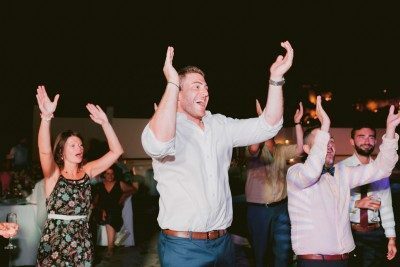 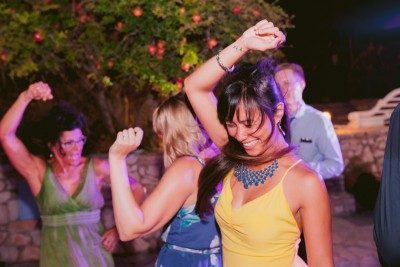 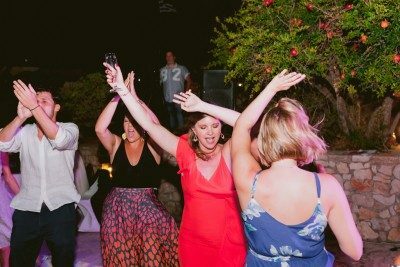 We also loved seeing all the dance shots of our guests, and their big smiles! 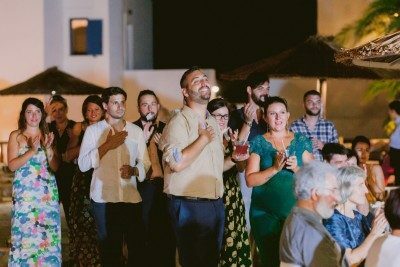 It was a sign that everyone was having a great time, which made us so happy! 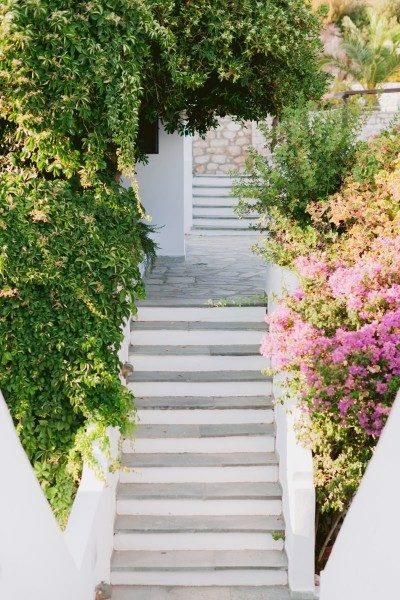 The day will go by so quickly, so take the time to really stop and take it all in. 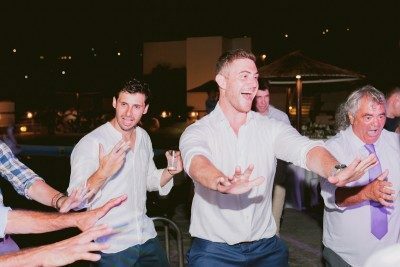 We did this several times during the day. 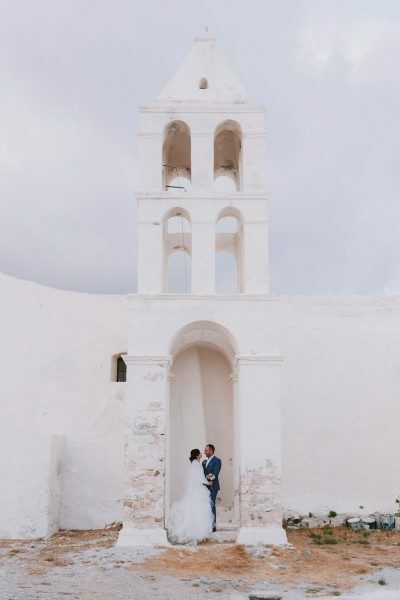 We stopped, looked around, and reminded each other how beautiful this was. 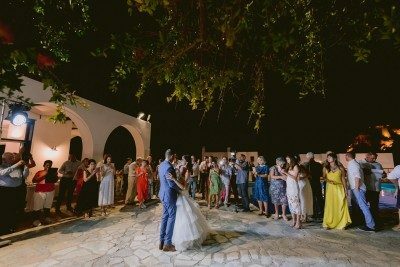 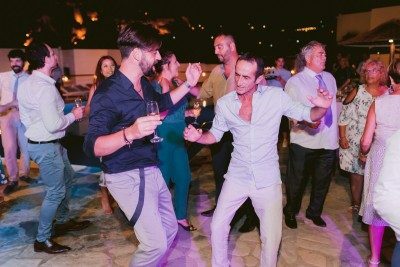 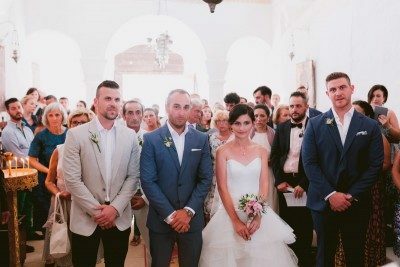 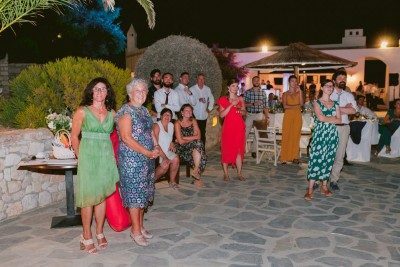 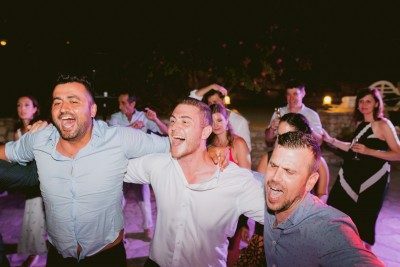 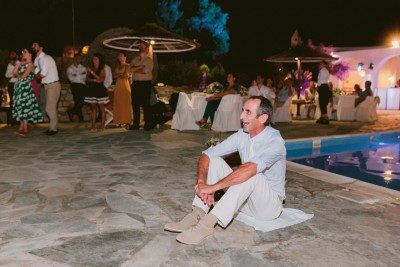 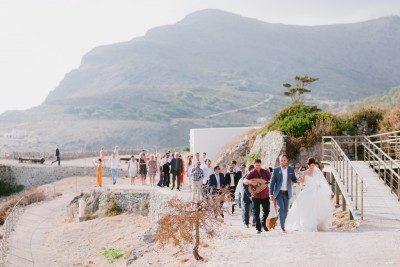 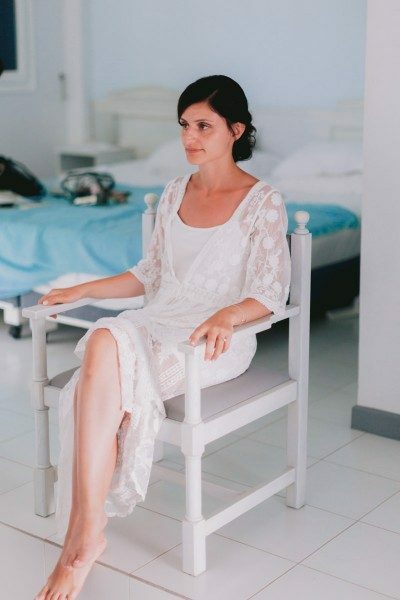 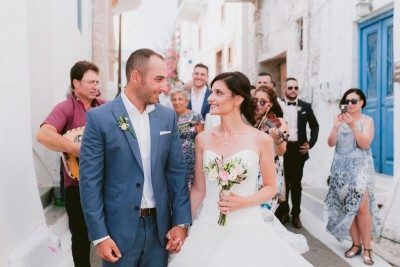 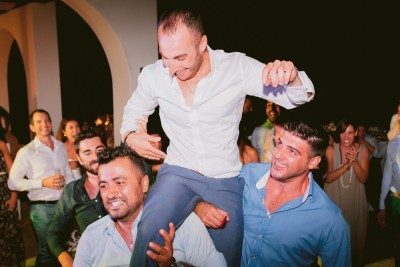 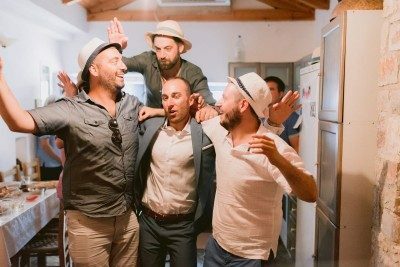 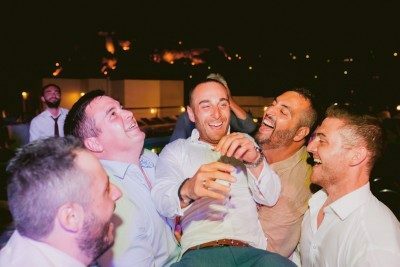 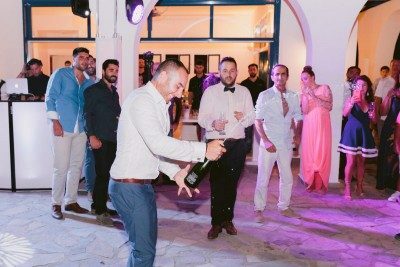 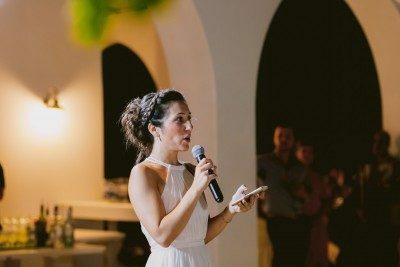 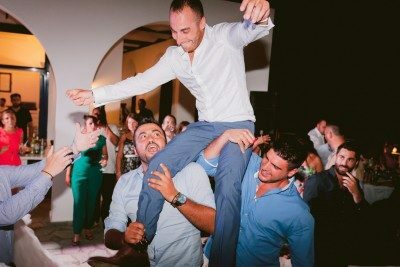 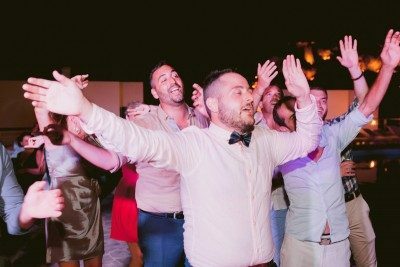 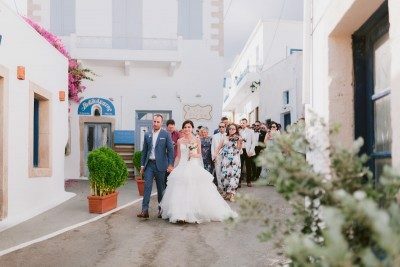 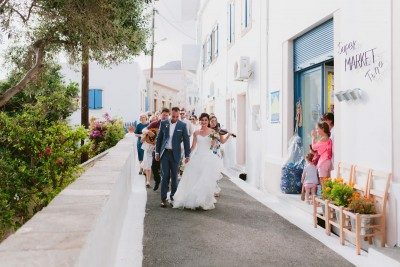 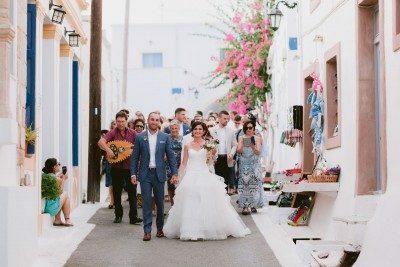 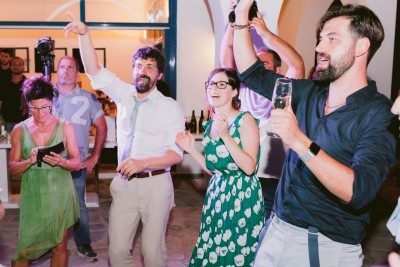 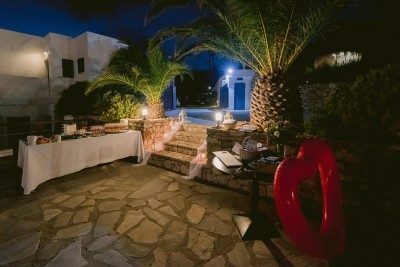 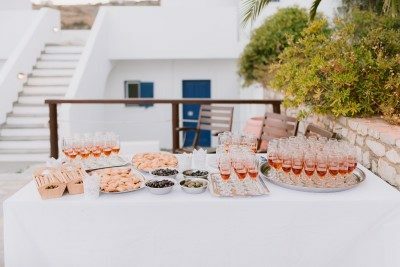 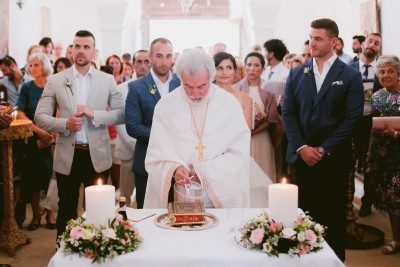 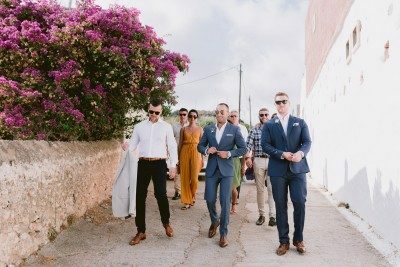 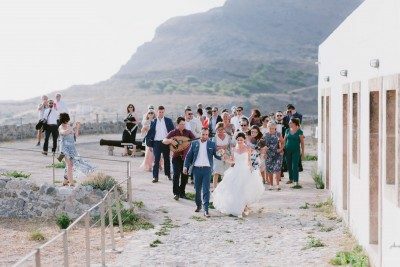 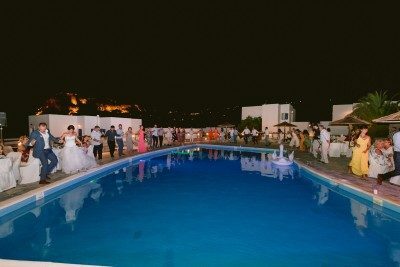 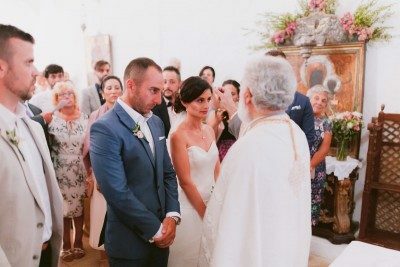 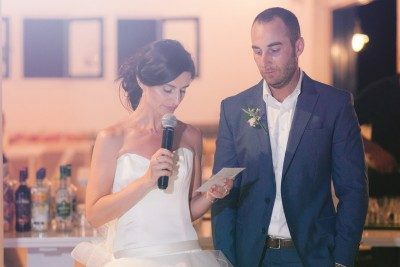 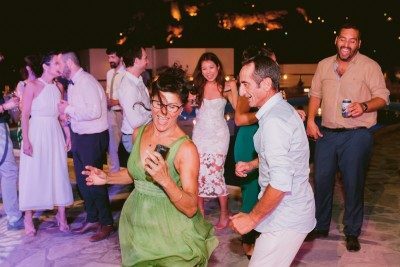 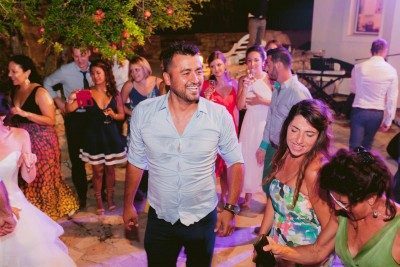 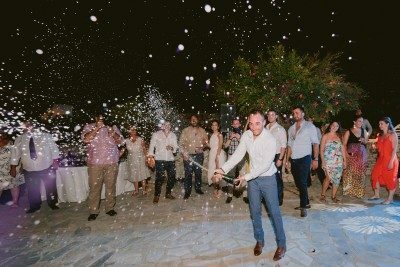 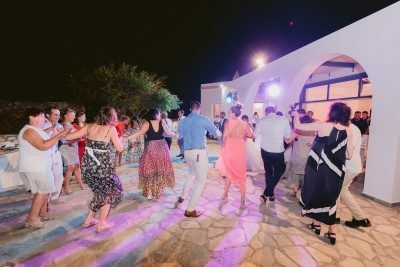 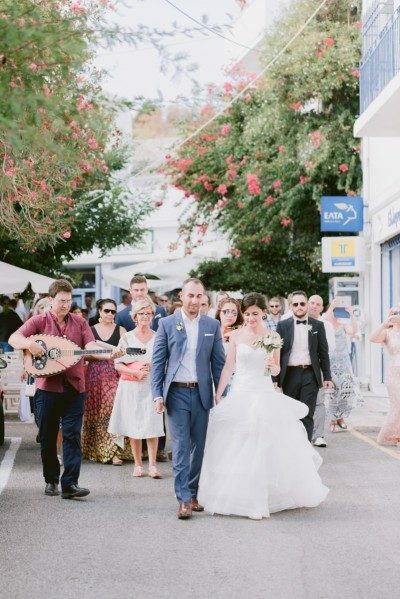 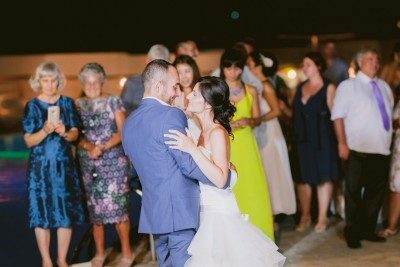 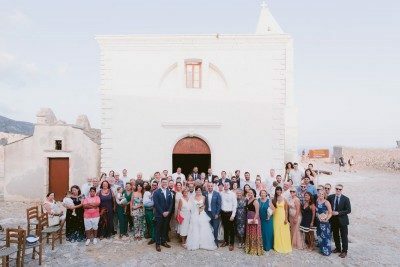 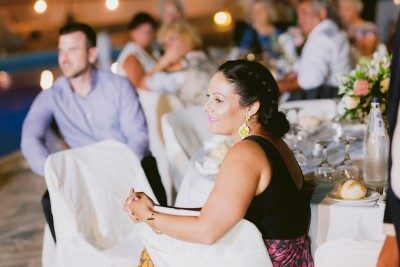 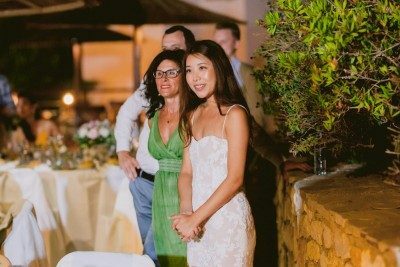 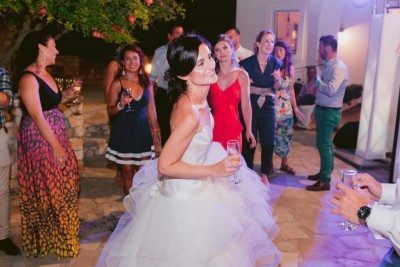 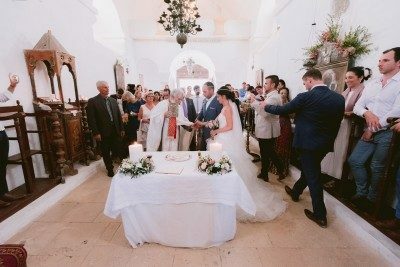 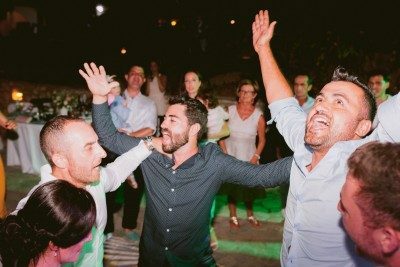 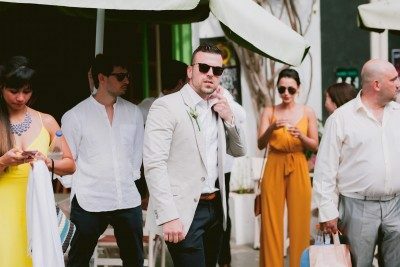 Our family and friends united on a Kythera wedding to celebrate a happy moment. 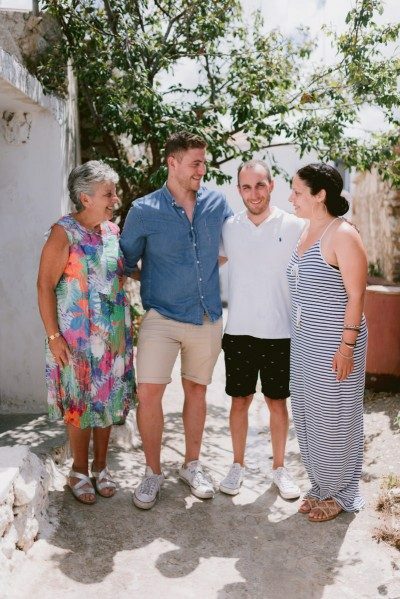 How often can you have your closest friends and family all together? 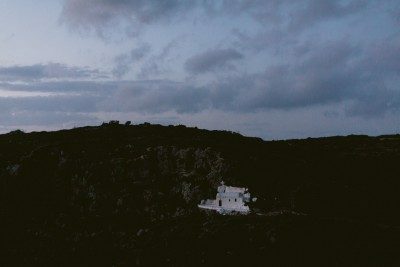 At the end of the day, this is what matters most. 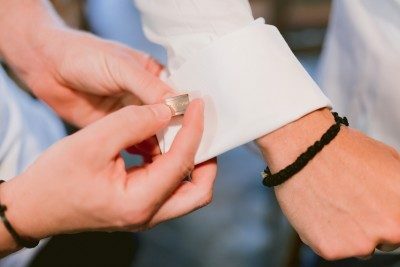 The rest is just details.